The One & Only - Leased Ferrari: Michael Lau x Nike Air Force 1 "Psychiatric Ward"
Here is a first look at the Nike Air Crazy Force 1 sneaker and toy designed by Japanese superstar Michael Lau. 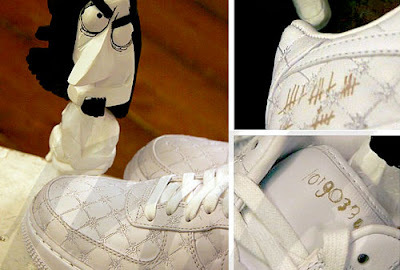 The Air Force 1 comes with a quilted upper and several laser customizations. The toy gets the patient look and matches the Air Crazy Force 1. Keep em stompin' in my AIR FORCE ONES!